Sign up for Broadjam today to follow The Anderson Bros., and be notified when they upload new stuff or update their news! 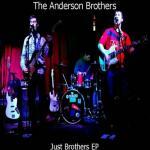 Just Brothers is the first EP released by The Anderson Bros. of New Glarus, Wisconsin. This is an eclectic mix of original blues and rock songs. A song about enjoying the simple things in life. Also featuring Tony DiPofi on harmonica.